The Internet is filled with woodworking videos, blogs and websites which offer a plethora of information and entertainment. If you’re not aware of very many of these, here is a little help. “Blogs” (shorthand for “Web Logs”) are one of the most popular items. A blog is a diary of sorts set up online so everyone can see it. Bloggers usually post information and articles several times a week on topics they think are of interest to like-minded people. One can simply navigate to a blog of interest and read what is available. Many times there are links to other blogs included and simply by clicking on those links, you can navigate to other sites on the web to dig deeper into a subject or find other things which interest you. The first is produced by Kari Hultman, who calls her blog (and herself ) The Village Carpenter, and her approach and style make her one of the best bloggers around on woodworking. Kari is a graphic artist in real life and it shows in the blog. She has a beautiful shop and does excellent woodwork and then writes about all of it several times a week. Last week she posted a video of her shop, and you need to turn your speakers on so you can hear the perfect music for a shop tour. (By the way, do you recognize the shop sign at the beginning of the video? Scroll down to Kidegory I below to order yours.) Note the comments section at the end of each entry. Kari gets lots of comments on her entries. Lost Art Press at blog.lostartpress.com is written by Christopher Schwarz, who also publishes Woodworking Magazine. Chris writes very well and his topics are usually about hand tools and hand tool methods, plus his musings on woodworking as a craft. Very well done. Stephen Shepherd produces the Full Chisel Blog. 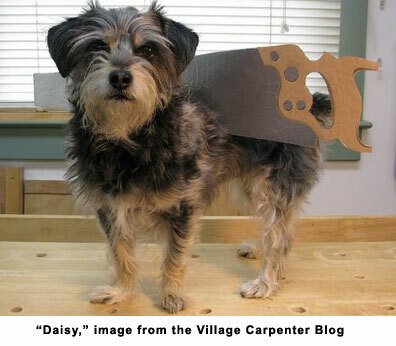 He is an old fashioned woodworker who spends a lot of time in research on old methods and tools. Right now he is working on the repair of an antique spinning wheel and blogs about it as he goes through the process. In his day job he works in history parks and museums as a docent and the way he does things is fascinating. He just published a book on hide glue that should answer all your questions on that subject. You will enjoy this blog. Links to other sites are often listed in all these blogs, so you can spend hours and hours chasing blogs all over the Web. You can also send comments to all these sites or ask questions about the topics being discussed. Join in, it’s fun.